US-based startup BaubleApp has launched an NFC enabled children’s necklace that plays a different audio greeting each day via an NFC phone. 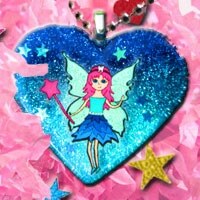 The US$15 FairyHeart necklace has an integrated NFC tag that allows owners to initially download a companion app before listening to the day’s audio message from the Tooth Fairy. “We decided to go straight to consumers with NFC devices and give them something enjoyable to use NFC for on a daily basis. We decided to strive for simplicity, rather than complexity,” BaubleApp’s Joanna Robinson told NFC World. The company will roll out further products, including holiday themed gifts, later this year.